Level up your burger game with these Harissa Butter-Stuffed Lamb Burgers. So much flavor basted from the outside in. Place the butter in a bowl and mash with a fork. Stir in the harissa paste and a pinch of salt. Whip together until evenly combined. Arrange a square of plastic wrap or wax paper onto a clean work surface and scrape the butter onto the center. Roll into a small log and seal. Place in refrigerator to solidify for at least 1 hour before using. In a large clean bowl, combine the lamb with the 1 teaspoon Ras El Hanout seasoning and a sprinkle of salt and pepper. Gently, form half of the lamb into 6 patties, about 2 oz each, with shallow indents in the center, like a crater. Form the remaining half into 6 thin patties. Place a small slice of the prepared harissa compound butter in the center of each crater and top with the thin patties, pinching the edges together securely. Cover and set the prepared lamb patties back in the fridge for at least 45 minutes before cooking. Preheat the grill for indirect fire. Clean and oil your grates. When ready to cook, season the lamb patties liberally with salt. Arrange the patties on the cooler side of the grill and cook to an internal temp of 160, flipping once during cook time. Remove from heat and allow to rest. The butter needs to melt through and seep into the burgers. If poked too soon, the hot butter will squirt out. When ready to assemble, prep the buns with a smear of tzatziki sauce and a layer of lettuce, tomatoes, red onion and cucumber if desired. Keep the ground lamb moist and flavorful by stuffing with the compound butter and using the indirect heat method for cooking. Build a fire on one side fo the grill, close the lid and allow the air to circulate. 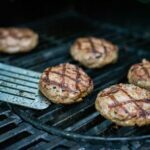 Cook the patties over the cooler side of the grill, where the drippings won't cause flair-ups and the radiant heat is cooking them.